Some of this third-party software possesses features well beyond those available from the standard Davis Weatherlink program or offers data presentations that are cosmetically more appealing. So, while there’s no doubt that the Weatherlink software itself is a well-proven, robust and professional piece of programming, an increasing number of users choose to run one of these alternative third-party programs. Please note that although we’re listing this information here within our Products section, we don’t currently sell any of these programs (with the exception of licences for the Virtual VP utility). The information is presented here simply so that you can view a listing of and links to the various programs at the same time as reviewing your choice of weather station hardware. Some of the programs are free and for virtually all programs you can download a 30-day trial version to see how well you get on with it before splashing out and buying a licence. Almost all of the programs are best downloaded from the authors’ websites, where you’ll typically get the latest versions and cheapest prices (for those programs that aren’t free). But just as an initial pointer, for any Windows users wanting a main alternative program to Weatherlink, the two most popular choices in the UK are Cumulus and Weather Display. The full listing of VP-compatible software below is divided into two main sections: alternative programs and add-on programs. Alternative programs are alternatives to the standard Weatherlink software, ie they typically provide a reasonably full set of features for logging and presenting weather data and for managing live weather-reporting web pages. The add-on programs, as you might expect, are designed to run in harness with either the standard Weatherlink program or one of the main alternatives and typically add some specific extra functionality to the set of standard features provided by the main program. It is a fact of life that the great majority of PC users run a version of Microsoft 32-bit Windows as their main operating system (OS). So, not surprisingly, most VP-compatible programs are also designed to run under 32-bit Windows – writers of third-party programs will obviously see the greatest interest in their programs by writing specifically for the Windows OS. The only other OS supported directly by Davis in a version of the Weatherlink software is OSX for the Apple Mac (although this is different and more limited than the equivalent Windows version). Note that even 64-bit Windows is not officially supported by Davis. Although the widest choice of third-party programs is provided for Windows users, a few authors have specifically written programs for minority operating systems in the overall Unix family, most notably for Mac OSX and for Linux. So solutions are available for almost any common OS, but the choice of program and the features that a program offers may be relatively limited for anything other than Windows. In general, we would suggest that even if you routinely use an OS other than Windows, it is well worth considering using an older 32-bit Windows PC as a dedicated weather PC. This is not a ‘theological’ view on Windows vs Mac or Linux, but reflects the fact that even if you find a program compatible with your OS that offers all the features you need, there still may be major practical difficulties to overcome. For instance, getting support for any apparent logger issues may be problematic – the Windows version of Weatherlink accounts for perhaps 98% of sales (at least in the UK), so few dealers are able to offer any practical support whatsoever for non-Windows operating systems. And remember also that the logger data needs to reach the actual program – most Weatherlink loggers these days are the USB logger version, which requires an appropriate third-party ‘driver’, written by the maker of the USB chip used in the logger (which isn’t Davis), to deliver the USB data stream to the program. So even if the program itself may be nominally compatible with your non-Windows OS, if there’s not a robust USB-chip driver available for that particular OS then the system overall can’t work reliably. Virtual VP (VVP) is an inexpensive utility that provides a very handy solution to a specific problem. This problem is that a VP logger can only pass data to one specific program at a time. If one program is talking to the logger then a second program can’t get a look-in until the first program completely drops its communications link to the logger. What this means in practice is that two or more programs cannot simultaneously be receiving live weather data from the logger and so the default situation is that you can run only one main weather program at a time. You may say – so what – why does this matter? And if you’ve already chosen one main weather program that delivers all that you need then it doesn’t matter – there’s absolutely no point in running a more complex PC configuration than you need. If a simple solution meets all your requirements then stick with that – it will typically be the most reliable answer. There’s more information about VVP on its own page. These programs are multi-featured alternatives to the standard Davis Weatherlink software, which is supplied free with each new Davis data logger. We’re not attempting to provide anything other than listing and linking information here – there simply isn’t space for any summaries of features or of display examples (although a few display examples can be found elsewhere on our introducing loggers and software page). For any more detailed information please follow the links to the product descriptions or support sites for each program. NB There is a comparative review of a number of these packages on the WXForum website originally written a few years back by Gary Oldham and last updated in 2006. This is obviously rather out of date now (it doesn’t mention Cumulus at all for instance) but still has some value as a starting point for comparing the various programs. Feel free to let us know about other unlisted programs, provided they offer comparable features and are available in a robust, finished version. This is a specific category of add-on program that allows web pages to display genuinely real-time weather data with updates, in principle, as often as every 2-3 seconds, thereby being able to show individual wind gusts on a public web page. Traditional (D)HTML-only web pages are not suitable for such high-frequency updates and so special web-page technology using Flash or Silverlight is needed. A bonus of using Flash/Silverlight is that cosmetically very attractive web page presentations can be designed, so not only do do these displays update frequently but they also look great too. It’s well worth taking a look at some example of what these real-time programs can deliver – the web page results can be very impressive. There are currently three different real-time webpage programs available. In every example to date, the task of generating these displays is split between two different programs. The real-time display program takes care only of the final graphic display in the user’s web browser and relies on a feed of pre-processed weather data in a specific format from a ‘parent’ program, which is one from among the alternative programs listed above. 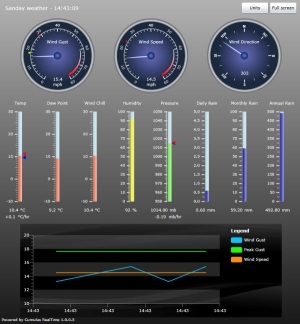 So, for example, Weather Display Live (WDL) is the Flash real-time program that accepts a data feed from the well-known Weather Display (WD) program. To be clear, all Vantage family stations – ie original Vantage Pro 1, the more recent Vantage Pro 2 and the latest Vantage Vue models – use the same set of data loggers, most commonly the 6510USB or 6510SER loggers. And whichever station model is used to generate the raw data, the output format from the logger is essentially** identical. So VP-compatible software should in general be compatible with any of the the main current types of Vantage station, ie VP1, VP2 and Vue. ** Strictly speaking, the precise data output format can vary in one or two details with the console firmware version. It’s also obviously essential that the linked PC is matched appropriately to the logger’s output interface type (ie USB or Serial or Ethernet). So in practice the PC configuration may need tweaking to achieve 100% compatibility of software with the particular station and logger types, but this should be readily possible to achieve in the vast majority of cases.